As Travis Kittleson said in his post-race interview on opening night of the 39th Annual World Series of Asphalt Stock Car Racing; racing is a constant learning sport. It was Kittleson’s first trip to Victory Lane in any type of car in well over a year and it was obvious after Kittleson lit his tires up in an impressive burnout after the race was over. “It feels good to be back in Victory Lane,” said Kittleson, who started on the outside pole following the invert. “It doesn’t matter if it’s a 25-lapper here or a shopping cart race. It feels good. “It seemed like at the beginning of the race, Jay had a good car. He was pressuring me and beating on me pretty good. I’ll tell you what though, I learned a hard lesson last week when I lost the race with two to go by not playing defense. Me and my dad had a long talk and he told me that I needed to work on my defense. We knew my offense was pretty good. Kittleson was referring to last weekend’s Pete Orr Memorial at New Smyrna Speedway, where he was leading with just two laps to go when he got the bumper laid to him from behind, moving him out of the lead and eventually back to third when the checkers waved. On Friday night at the same track, Kittleson was not going to be denied. Travis held off constant barrage of bumps from second-place Jay Middleton over the first 15 laps of the 30-lap Super Late Model feature, then pulled away to capture the victory on the first night of Speedweeks, leading all 30 laps in the process. And for his front-stretch long burnout? Travis Kittleson was the man to beat on Friday night. A mid-race caution for Shawn Dunning’s accident allowed Kittleson to cool the tires and pull away at the end, leaving Middleton chasing in second. “Not bad at all. This is our best finish ever here at Speedweeks,” said Middleton. 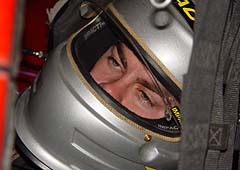 Fifteen-year-old Chase Austin, one of the Hendrick Motorsports driver development participants, failed to make one lap after mechanical problems took him out of the race. He is in Smyrna to run all nine nights in an SS Racing prepared car, under the guidance of Butch Miller (who served as Chase’s spotter) and Deon Deneau. 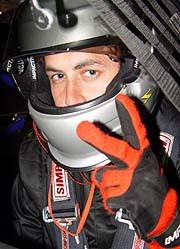 David Rogers, who was injured in an accident at Orlando Speedworld last year, made his first trip back to the track behind the wheel of a race car on Friday night, finishing 11th. Justin Drawdy had a good night. Florida hotshot Justin Drawdy settled into third place early and rode there for the remainder of the night, staying out of trouble after getting spun in one of the early cautions. It took four attempts to get the Super Late Model feature started on Friday night. That was tough for Kittleson, who kept getting the jump on Middleton heading into turn one. The Super Late Model field started 32 cars on Friday night, however nine cars failed to complete one lap, victims of accidents or mechanical problems before the race ever had one official green flag lap ran. 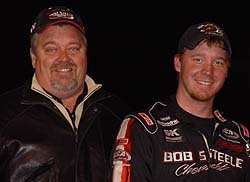 The night’s pole winner Jimmy Cope was taken out when he ran into the back of Justin Drawdy’s car during one of the stack-ups. Mike Good was run into by former CART driver Michelle Jordane, who is running a Super Late Model at Speedweeks in addition to his full compliment of NASCAR Busch Series races in 2005. Jordane was able to continue. Ted Christopher, who is racing in both the Super Late Models and the NASCAR Tour-Type Modifieds during Speedweeks, finished fourth in his SLM after winning the night’s Mod feature. Jerry Artuso, the nights fastest qualifier, made little work coming through the field after starting fifth, to capture the Late Model feature on Friday in another caution-filled race. 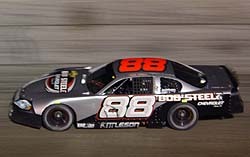 Tim Russell started on the pole after qualifying fifth. Tate Pierce, Rich Clouser, Martin Pierce and Russell rounded out the top-five.